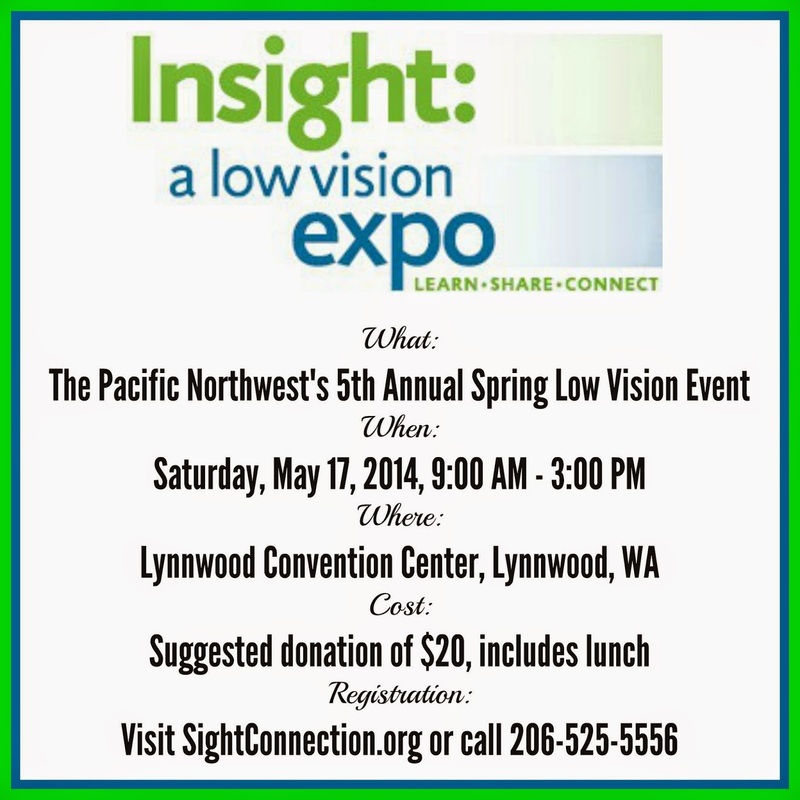 *I am receiving two passes to Insight: A Low Vision Expo from SightConnection in exchange for writing about the event. The words and opinions are my own. You might remember me blogging all about my need for new eyeglasses and the process I went through to get them last year. As a visually impaired person, it is not as easy for me as it is for fully sighted people because my prescription is tricky, both to determine and to make. It is so not easy that I waited over 10 years to do it! Bad Jennifer, very bad. You can see in my little avatar there in the sidebar that I'm wearing glasses. Those are the new ones I finally got, and it was with help from a resource for people with low vision called SightConnection. SigntConnection provides rehabilitative services throughout King, Snohomish and Skagit counties in Washington state to individuals living with eye diseases such as macular degeneration, glaucoma, cataracts, diabetic retinopathy, or other causes of low vision and blindness. SightConnection created Insight: A Low Vision Expo, being held in two weeks, in response to the growing numbers of people living with low vision in order to give them a whole day to discover the best resources for low vision. Keynote from Dr. Mary Lou Jackson, a former Harvard professor who is an ophthalmologist and leading researcher on Charles Bonnet Syndrome. Keynote from Dr. Orli Weisser-Pike, an Occupational and Low Vision Therapist who wil discuss how to balance supporting and empowering your loved one with low vision. I am excited to attend this event as it has been a very long time since I've learned anything about ways to make life with low vision easier. There are probably so many cool new gadgets and other things I've never heard of. I'm also never around other people who have the same problem I do. I hope that if you're reading this and you live in the Pacific Northwest, know or are someone with low vision, or are just a cool person, that you will share this on social media to spread the word!